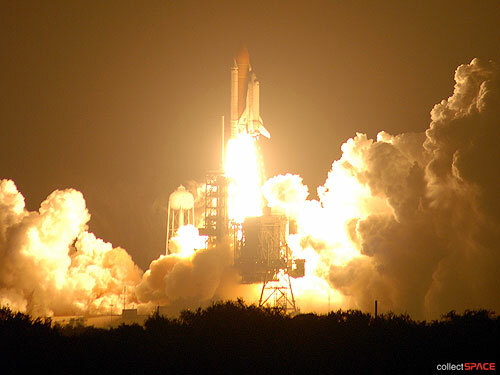 NASA began counting down on Tuesday to the launch of space shuttle Endeavour. Liftoff is scheduled for Friday at 7:55 p.m. EST (0055 GMT Saturday). 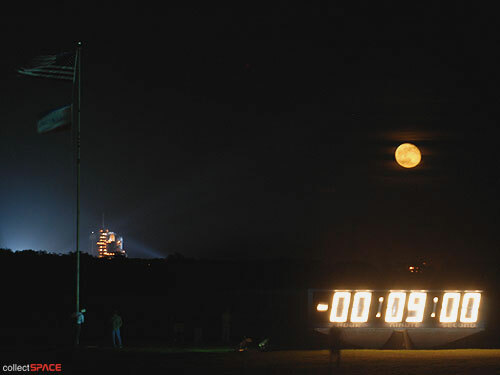 The STS-126 countdown began at 9:30 p.m. EST at the T-43 hour mark. There are several built-in holds that will mark milestones leading up to launch. The STS-126 crew are to deliver about seven tons of equipment and supplies to the International Space Station (ISS) during their 15-day mission. The STS-126 crew arrives in Florida. 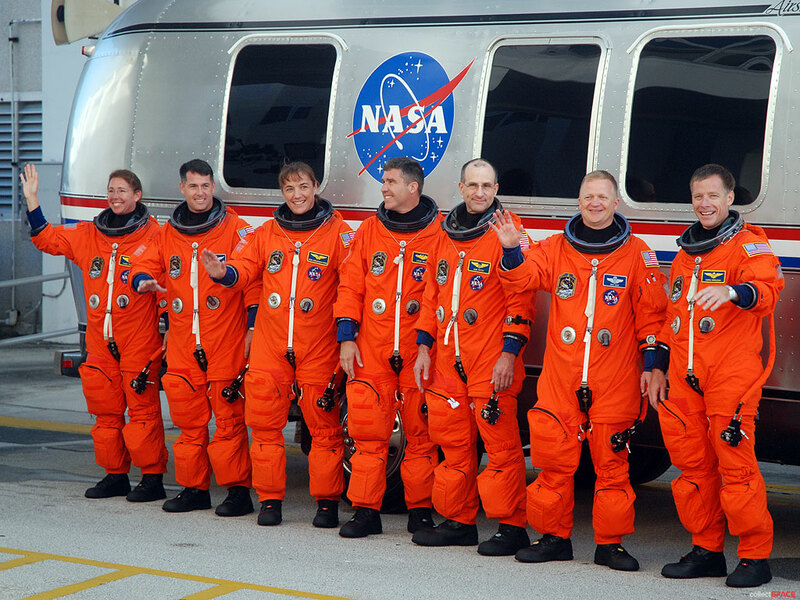 From left to right: mission specialist Don Pettit, pilot Eric Boe, commander Chris Ferguson, spacewalkers Heide Stefanyshyn-Piper, Shane Kimbrough, Steve Bowen and ISS flight engineer Sandy Magnus. 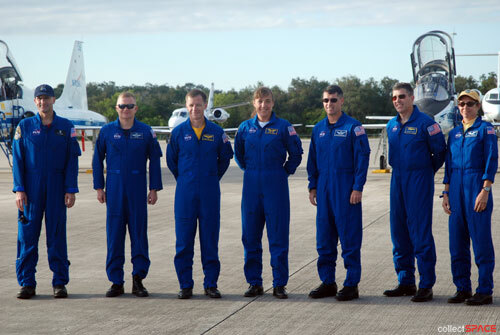 The seven astronauts arrived by T-38 jet at Kennedy Space Center earlier in the day. "This mission is all about home improvement," commander Chris Ferguson said minutes after the crew landed. "Home improvement inside and outside the station." In addition to installing the new equipment -- including new crew quarters, a new toilet, a new kitchen, a new refrigerator and new exercise equipment -- the mission will also transfer a new crew member to the ISS and conduct four spacewalks to service the joints that turn the station's massive solar arrays. "There comes a time to start doing maintenance, and this is it," said lead spacewalker Heide Stefanyshyn-Piper. Preparations on Endeavour are on schedule for the liftoff with officials reporting no technical issues standing in the way of a launch. There is currently a 60 percent chance of meeting launch weather criteria for Friday's attempt. That falls to 40 percent on Saturday, but back up to 70 percent on Sunday. A weather front that could produce thick clouds is expected to enter the region on Friday or Saturday. Under certain conditions, the clouds can be thick enough to prompt lightning concerns. 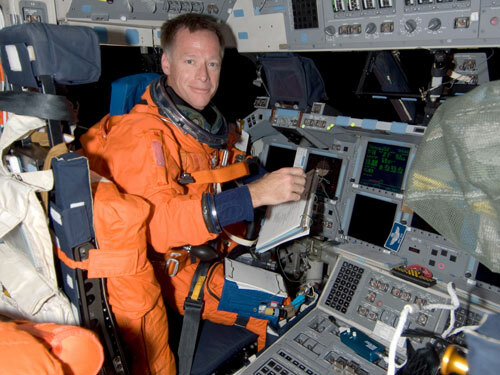 The Missouri University of Science and Technology has set up a blog from space for astronaut Sandy Magnus' trip on STS-126 and Expedition 18 to the ISS. It is cleverly named "spacebook." During a pre-launch briefing held on Wednesday morning, mission management team chair LeRoy Cain said that "Endeavour is ready, the crew is ready" and that his team has given a "go" to proceed towards a launch attempt for STS-126 on Friday evening. The weather forecast for Friday continues to call for a 60 percent chance of acceptable conditions for the 7:55 p.m. liftoff. The main concern is a cold front moving towards Florida, increasing the chance for clouds and showers at the Kennedy Space Center. Space shuttle Endeavour's fuel cells were successfully loaded last night with liquid oxygen and liquid hydrogen as the countdown progressed toward a Friday evening launch. The cells will convert the fuel into electricity and water for the 15-day mission. As the loading was underway, STS-126 commander Chris Ferguson and pilot Eric Boe flew several practice landings aboard NASA's Shuttle Training Aircraft overnight. The weather forecast for Friday at 7:55 p.m. EST has slightly improved to just a 30 percent chance of conditions preventing the launch. If the weather does not cooperate and a 24-hour scrub is called, there is presently a 70 percent chance on Saturday that the conditions will prohibit a liftoff. 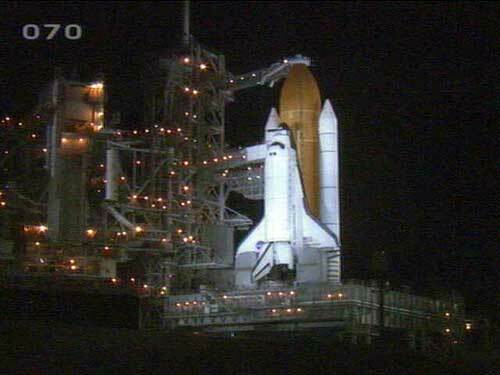 The enclosed gantry that surrounded Endeavour was retracted to its launch position Thursday evening at 11:58 p.m. EST as the liftoff of STS-126 nears. The launch team at NASA's Kennedy Space Center started filling Endeavour's external tank with liquid oxygen and liquid hydrogen at 10:40 a.m. EST. Is there any chance to find a key personnel list of this mission? Loading of Endeavour's external tank with 500,000 gallons of cryogenic liquid oxygen and hydrogen was completed at 1:31 p.m. EST. The "topping off" of propellants into the tank will continue until the launch. All systems aboard the shuttle are functioning normally and are ready for launch. The seven STS-126 astronauts walked out of the Operations and Checkout (O&C) building just after 4:00 p.m. EST to the cheers and applause from a crowd wishing them well for the mission. They waved back, paused for a quick pre-flight photo and then climbed aboard the Astrovan to take them on their 20-minute trip to Pad 39A. The crew is now strapped into their seats on-board Endeavour. Ferguson, Boe, Pettit and Bowen are on the flight deck; Stefanyshyn-Piper, Kimbrough and Magnus are on the middeck, or lower level of the crew compartment. 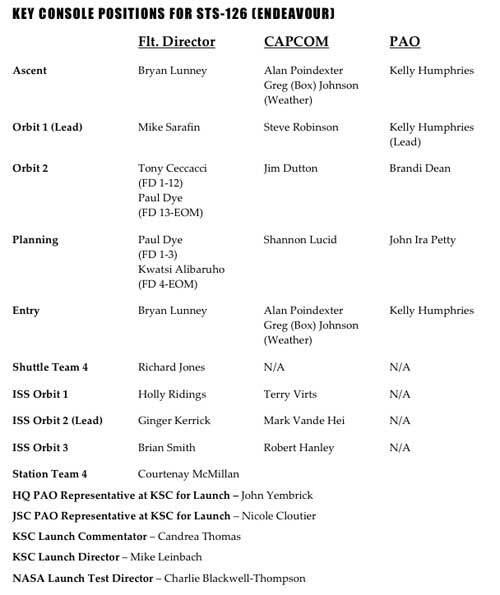 Mission managers have given Endeavour a "go" during a final "go-no go" poll to launch the STS-126 mission. 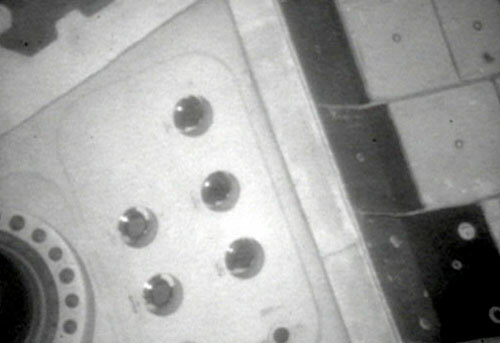 The discovery of a missing pin used to secure a door-like metal framework between the orbiter and white room (when deployed) posed a brief concern before the decision to launch could be given. Vibrations during liftoff could cause the door to shake and swing, but it was determined that a nearby handrail would prevent it from impacting Endeavour. During the last few minutes remaining in the countdown, the access arm on the rotating service structure will swing away from the shuttle and the vent hood, called a beanie cap, covering the point of the external tank will be lifted up and away. A computer, called a ground launch sequencer, has taken over all the operations of Pad 39A and will be giving the commands that will launch Endeavour. Space shuttle Endeavour and its seven-member crew lifted off from NASA's Kennedy Space Center at 7:55 p.m. EST Friday to repair and remodel the International Space Station. Endeavour's STS-126 mission carries to space about 32,000 pounds, including supplies and equipment necessary to double the crew size from three to six members in spring 2009. The new station cargo includes additional sleeping quarters, a second toilet, a water reclamation system and a resistance exercise device. 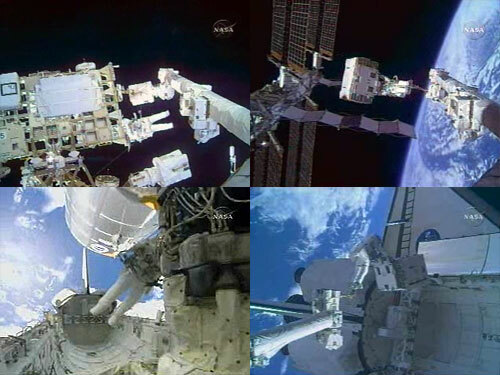 The mission's four planned spacewalks will primarily focus on servicing the station's two solar alpha rotary joints, which allow the outpost's solar arrays to track the sun. The starboard SARJ has had limited use since September 2007. Shortly before launch, Commander Chris Ferguson thanked the teams that helped make the launch possible. "It's our turn to take home improvement to a new level after 10 years of International Space Station construction," he said. "Endeavour is good to go." Joining Ferguson on Endeavour's 15-day flight are Pilot Eric Boe and Mission Specialists Donald Pettit, Steve Bowen, Heidemarie Stefanyshyn-Piper, Shane Kimbrough and Sandra Magnus. Magnus will replace current station crew member Greg Chamitoff, who has lived on the outpost since June. She will return to Earth on Discovery's STS-119 mission, targeted for February 2009. Did you see Endeavour launch? Are you following the mission? Share your thoughts. The STS-126 crew on-board Endeavour began their first full day in orbit at 9:55 a.m. CST to the wake-up song "Shelter" by Xavier Rudd. And these waves they comfort me. The song was played for commander Chris Ferguson as selected by his brother. While Endeavour continues on its path to rendezvous with the International Space Station, the crew will spend most of today using the orbiter's robotic arm and boom to inspect the shuttle's thermal heat shield and outer surfaces for possible damage sustained during launch. They will also check out the spacesuits they will don later during the mission and deploy the docking ring that will allow them to berth at the space station tomorrow. The STS-126 crew spent the day completing a five-hour inspection of Endeavour's heat shield. Ground controllers will use these sensor images, as well as those collected during launch, to ensure that the shuttle's thermal protection system is in good shape for reentry. Preliminary analysis suggested that a small piece of thermal blanket may have come loose from the aft portion of the orbiter 33 seconds into yesterday's ascent. If the blanket is missing, which flight controllers are not sure yet is the case, it is less than an inch thick, between 12 and 18 inches (30-45 cm) long and 4 inches (10 cm) wide. The area from which it may have separated is not of great concern since it is not an area that experiences high heat during reentry. The crew captured some images of the area during their inspection today, which will allow the ground controllers to look more closely and confirm the loss of the blanket and its size. Besides the blanket, engineers were working two minor glitches with Endeavour's KU-band antenna, a steerable dish antenna used to transmit data, voice and television signals. It can also be used as a radar to assist with rendezvous. The antenna is failing to keep a lock on relay satellites, as well as having a problem when switching between KU- and S-band communications. The cause has not yet been identified, though both issues can and have been addressed by workarounds controlled by the ground. If the antenna also fails in radar mode during tomorrow's rendezvous, the crew can switch to using the shuttle's star trackers for navigation, a procedure in which they are also trained. Tomorrow's docking is scheduled for 4:04 p.m. CST. The crew is due to go to sleep tonight at 12:25 a.m. and will awake at 8:25 a.m. The blanket material in question is known as FRSI (Fiberous Reuseable Surface Insulation). It is a thin nomex material. FRSI is designed to withstand temperatures of only 370 degrees Celsius (700 degrees farenheit) and as such it is used on areas of the orbiter that see the lowest heat loads at reentry. It is not to be confused with Advanced Fiberous Reuseable Surface Insulation (AFRSI), which is much thicker and used for hotter areas where white LRSI tile is not used. The umbilical attachment point below the area where the FRSI was suspected to have fallen off does not have any insulation blanket material or tile on it at all. Flight Day 3: Docking day! Soon-to-be-space station resident Sandy Magnus and her Endeavour crewmates awoke at 8:25 a.m. CST to the Rolling Stones' "Start Me Up", as chosen by Magnus' family. You got me ticking gonna blow my top. I walk smooth, ride in a mean, mean machine. "Good morning to everybody in Houston!" radioed Magnus in response to capcom Shannon Lucid's greeting. Endeavour is scheduled to dock to the station at 4:04 p.m. CST after a series of rendezvous maneuvers, including a 'backflip' to allow the ISS residents to photograph the orbiter's underbelly heat shield for inspection. After opening the hatches and greeting each other, one of the first activities for the joint crews will be to swap Soyuz seatliners between returning flight engineer Greg Chamitoff to Magnus, who will then officially become part of the Expedition 18 crew. STS-126 commander Chris Ferguson and pilot Eric Boe fired Endeavour's orbital maneuvering system (OMS) engines at 1:26 p.m. CST to refine the shuttle's approach as it closed in on the International Space Station. Before docking, Ferguson guided the orbiter through the nine-minute rendezvous pitch maneuver, a back-flip to allow the ISS crew to take photos of Endeavour's heat shield. Space shuttle Endeavour docked with the International Space Station at 4:01 p.m. CST as the two vehicles flew over northern India at an altitude of 212 statute miles. "That was a spectacular, beautiful sight to see you guys coming up underneath us and, wow!" radioed Greg Chamitoff to Endeavour's crew after they docked. The hatches between the space station and shuttle were opened at 6:16 p.m. CST, as Endeavour's crew of seven astronauts were welcomed by the three ISS Expedition 18 crewmembers. Upon further study of the imagery, mission managers have been able to confirm that all thermal blankets are in place near the area that was of initial concern. The debris that was seen falling in the ascent video was likely ice and it did not strike the shuttle. Separately, recovery of the solid rocket boosters continues. Mission managers had expected to review the SRB on-board video on Tuesday, but that may be delayed by a minor issue with a seal on the left booster requiring a slower tow back to the port. As of 8:50 p.m. CST and the transfer of her individual equipment liner kit (IELK), Sandy Magnus became Flight Engineer 2 on the ISS Expedition 18 crew and Greg Chamitoff joined the STS-126 crew as a mission specialist. Meanwhile, astronauts from both crews used the station's robotic arm to hand off the orbiter boom sensor system (OBSS) to the shuttle's robotic arm in case it is needed for further orbiter heat shield inspections. 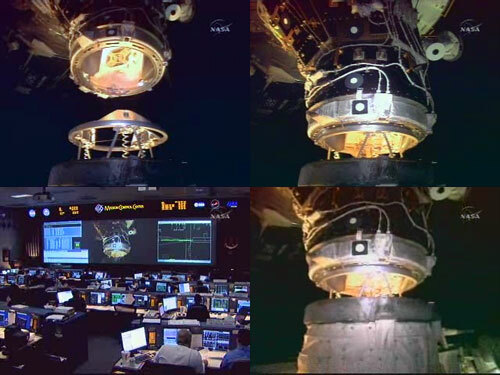 The STS-126 crew tested a new HD downlink method on Sunday evening utilizing some of the footage they captured during their rendezvous pitch maneuver "back flip" prior to docking with the International Space Station. The crew will go to bed at 12:25 a.m. CST on Monday and be awakened at 8:25 a.m.
Today's wake-up call, "London Calling" as performed by The Clash, came about ten minutes late this morning as "ratty comm" kept mission control from contacting Endeavour's crew until 8:35 a.m. CST. The song was played for mission specialist Stephen Bowen at the request of his family. Phoney Beatlemania has bitten the dust. Meltdown expected, the wheat is growing thin. "We're all up and ready to go," replied Bowen to the call. Today, the crew will use the station's Canadarm2 robotic arm to grapple and unberth the Leonardo Multi-Purpose Logistics Module (MPLM) from inside Endeavour's payload bay to attach it to the Earth-facing port on Node 2. This is the first time an MPLM will be docked to the Harmony module. Meanwhile, the astronauts will begin moving supplies between the shuttle's middeck and the station before entering Leonardo later tonight. Bowen and Heide Stefanyshyn-Piper will then begin preparations for conducting the mission's first spacewalk tomorrow, reviewing procedures and moving into the station's Quest airlock for a 'campout' overnight to purge the nitrogen from their bloodstream. STS-126 mission specialists Don Pettit and Shane Kimbrough at the controls of the station's robotic arm grappled the Leonardo Multi-Purpose Logistics Module (MPLM) inside Endeavour's payload bay at 10:39 a.m. CST. Leonardo is one of three differently named large, reusable pressurized Multi-Purpose Logistic Modules (MPLMs) used to ferry cargo back and forth to the station. Including STS-126, the MPLMs have flown eight times since 2001. Leonardo was the first MPLM to deliver supplies to the station and STS-126 is its fifth flight. The cylindrical modules include components that provide life support, fire detection and suppression, electrical distribution and computers when attached to the station. The Italian-built, U.S.-owned logistics modules are capable of carrying more than 7.5 tons (15,000 pounds) of cargo, spares and supplies, the equivalent of a semi-truck trailer. Carrying 16 system and cargo racks, Leonardo was modified to allow 12 additional cargo bags the size of carry-on suitcases to be flown inside the module's rear end cone. At 14,400 pounds of cargo, Leonardo is the heaviest MPLM to launch to date. Also included in Leonardo is the General Laboratory Active Cryogenic ISS Experiment Refrigerator, or GLACIER, a double locker cryogenic freezer for transporting and preserving science experiments that will remain in orbit at the end of the mission. 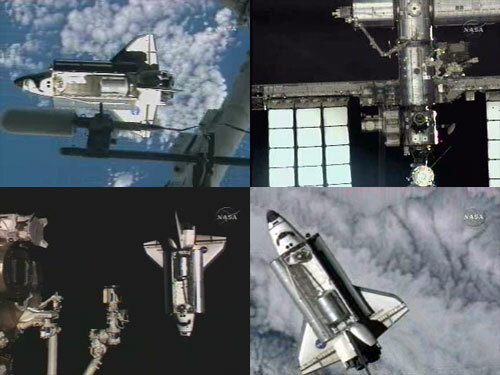 The freezer provides thermal control between +4 degrees Celsius and -160 degrees Celsius and can operate in both the space shuttle's middeck and the EXPRESS Rack in orbit. Additionially, an incubator/refrigerator, the Microgravity Experiment Research Locker Incubator, or MERLIN, is also flying in the MPLM. Though originally used for thermal control of scientific experiments, it will remain on the outpost and be used to store drinking beverages and food for a six-member station crew. Spare parts that are being transported include 11 solar alpha rotary joint (SARJ) trundle bearing assemblies that lubricate and allow the giant rotary joint to turn the Starboard 4 and Starboard 6 Solar Array Wings, a new ISS External Television camera that will be installed during the mission's fourth spacewalk, two hydrogen sensor units for detecting cross-contamination in the station's Oxygen Generation System, and two crew headsets with cabling and controls for improved space-to-ground and crew-to-crew communications. Leonardo is named after the Italian inventor and scientist Leonardo da Vinci. The two other modules are named Raffaello, after master painter and architect Raffaello Sanzio, and Donatello, for one of the founders of modern sculpture, Donato di Niccolo Di Betto Bardi. Raffaello has flown three times. Leonardo has flown the most because it is equipped with programmable heater thermostats on the outside of the module that allow for more mission flexibility. There are only two more MPLM flights scheduled before the station is complete and the space shuttle retires in 2010. Leonardo was docked at the nadir port of the Harmony Node 2 at 12:04 p.m. CST. Leonardo's hatch was opened at 5:43 p.m. CST, about two hours ahead of schedule. "We're very proud to announce that Leonardo made it aboard the space station safely," reported ISS Expedition 18 commander Mike Fincke to mission control. "The hatch is open, we have a nice air sample, and no damage or anything noted." "The International Space Station Expedition 18 and STS-126 crews are really happy to have Leonardo on-board. It looks beautiful," he added. Before the hatch opening, the three STS-126 first time fliers, pilot Eric Boe and mission specialists Steve Bowen and Shane Kimbrough took part in a series of three television interviews with networks in their hometowns (WXIA-TV and WAGA-TV in Atlanta [Boe, Kimbrough] and WHDH-TV in Boston [Bowen]). Working a few hours ahead of schedule, the joint shuttle and station crews began unpacking the equipment and supplies from inside the Leonardo logistics module. They completed the transfer of the advanced Resistive Exercise Device (aRED), as well as all the storage bags that were carried in the MPLM. As that work was originally scheduled for tomorrow, flight controllers were re-planning the crews' Tuesday to include moving two water reclamation racks that will recycle the astronauts' urine into drinkable water. The crew members today also moved cargo from Endeavour's middeck onto the ISS, including the Commercial Generic Bioprocessing Apparatus Science Insert-03. Designed to encourage learning and interest in science, technology, engineering and math among K-12 students, CSI-03 will examine the complete life cycle of painted lady butterflies, as well as the ability of orb-weaving spiders to spin a web, eat and remain healthy in space. Late Monday night, mission specialists Heide Stefanyshyn-Piper and Steve Bowen prepared for the first of four spacewalks planned during the mission. 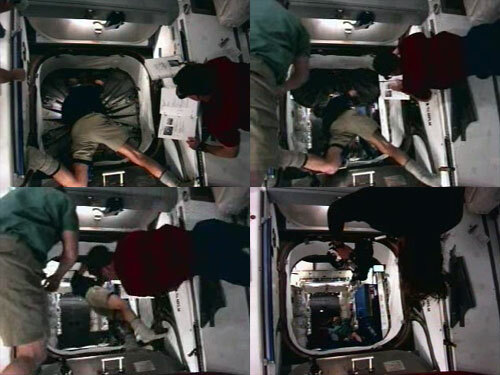 They are following a proven protocol known as the "campout" to spend the night in the Quest airlock to lessen the time it would take to prepare before starting the EVA, which is currently scheduled for 12:45 p.m. CST on Tuesday. The crew is scheduled to go to bed at 11:55 p.m. CST and be awakened at 7:55 a.m.
Mission specialist Shane Kimbrough and his Endeavour crewmates were greeted at 7:55 a.m. CST by the rock group U2's song "City of Blinding Lights". Kimbrough will serve today as the intravehicular officer for the first of four spacewalks planned for the mission. He will be assisting Heide Stefanyshyn-Piper and Steve Bowen as they work outside the station replacing a nitrogen tank assembly, completing assorted assembly tasks, and as they start cleaning and lubricating the starboard solar alpha rotary joint (SARJ). During the 6.5 hour spacewalk scheduled to begin at 12:45 p.m. CST, Don Pettit and Sandy Magnus will operate the station's robotic arm. Among the notes uplinked to the crew this morning was an update the inspection of Endeavour's heat shield. 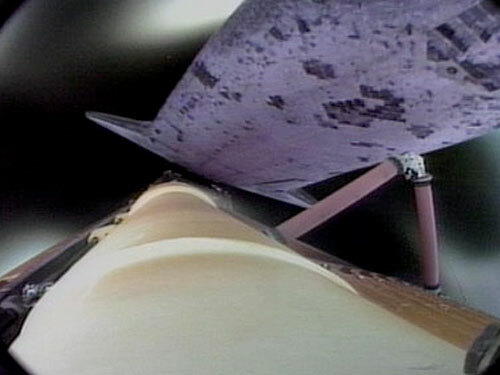 Mission managers have cleared the orbiter's wing leading edges for reentry and have ruled out the need for focused inspections (releasing the reserved time for such on Flight Day 6). 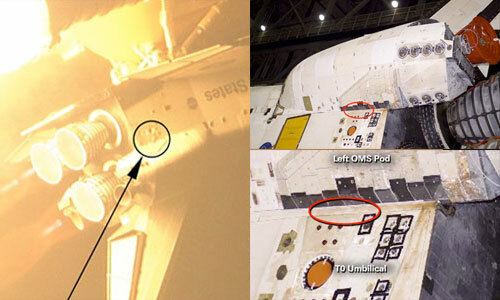 There were 13 "regions of interest" observed on the shuttle's heat shield, including five damaged tiles. None of the observed damage is considered significant but the imagery inspection team is still performing analysis of the areas and expects to be complete with the damaged tile assessment by tomorrow. The other eight regions were due to thermal barriers and gap fillers. Seven of these have been cleared, but a 15-inch gap filler protrusion on the right orbital maneuvering system (OMS) pod still requires some work. The team is not concerned about this gap filler, but wants time to fully assess it given that it is longer than previously observed protruding OMS pod gap fillers. The first of four planned spacewalks for the STS-126 mission officially began as Heide Stefanyshyn-Piper and Steve Bowen took their extravehicular mobility units (EMUs), or spacesuits, to internal power at 12:09 p.m. CST. Piper, in a red-striped suit, and Bowen, in the all-white suit, opened the hatch to the Quest airlock a few moments later to begin their scheduled 6.5 hours outside the space station. "We see you Steve, welcome to EVA," radioed Shane Kimbrough from inside Endeavour. Bowen, a first time flier, is making his first spacewalk. This is Piper's third EVA, having previously worked outside the station during the STS-115 mission in 2006. Their tasks today, like most of those on the remaining three spacewalks, will focus on the ISS's Solar Alpha Rotary Joints (SARJ). The joints are designed to rotate the station's 240-foot solar arrays, to keep them facing the sun for maximum production of electricity. Last year flight controllers noted an increase in power consumption by the starboard SARJ, and it has seen limited use. The port SARJ is working fine, but it will be lubricated during the fourth spacewalk. Today's spacewalkers will also take a depleted nitrogen tank from a station stowage platform to Endeavour's cargo bay and move a flex hose rotary coupler from the shuttle to that station stowage platform. 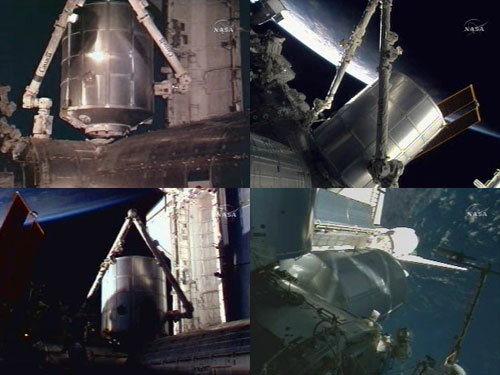 Additionally, they will remove an insulation blanket from the Japanese laboratory Kibo. After transferring an empty nitrogen tank and a flex hose rotary coupler between the shuttle and station, Heide Stefanyshyn-Piper and Steve Bowen set to work on cleaning the starboard solar alpha rotary joint (SARJ). "I think we had a grease gun explode in the large bag," Piper reported just after 2:30 p.m. CST, referring to one of the Braycote lubrication guns. "Because there's grease in the bag." As she was cleaning the bag and wiping the tools, the bag floated away. "Oh great," announced Piper as the bag moved beyond her reach, floating to the right and behind of the station. "We have a lost tool, um, I guess one of my crewlock bags was not transferred and it's loose." Inside the bag were a couple of grease guns, a wipe caddy, a scraper and its debris container, as well as a large trash bag and several tethers. Another bag carrying the same equipment is now being shared by Piper and Bowen. Flight controllers believed that there was enough supplies inside the one bag for the spacewalkers to complete the planned SARJ trundle bearing assembly removal and race ring cleaning. 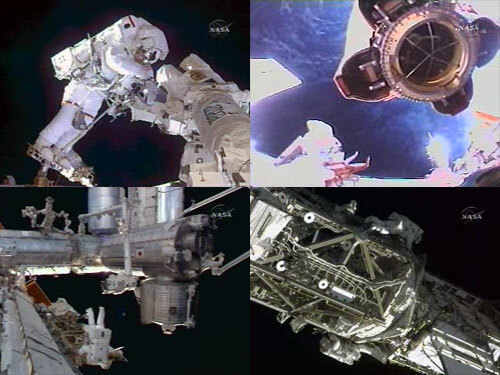 The first spacewalk of the STS-126 mission came to an official end at 7:01 p.m. CST. "You both did an awesome job today, it was an awesome EVA," commented Shane Kimbrough, congratulating Heide Stefanyshyn-Piper and Steve Bowen once they were back in the airlock after 6 hours and 52 minutes outside. "In spite of our little hiccup there, or our major hiccup, I think we did a good job out there," replied Piper. "You really did, you got all the tasks done," agreed Kimbrough, who served as the spacewalkers' intravehicular officer. "You guys were champs," radioed capcom Mark Vande Hei. "You rolled with the punches and made it all happen ahead of the timeline. Much appreciated, we had a great time watching you." 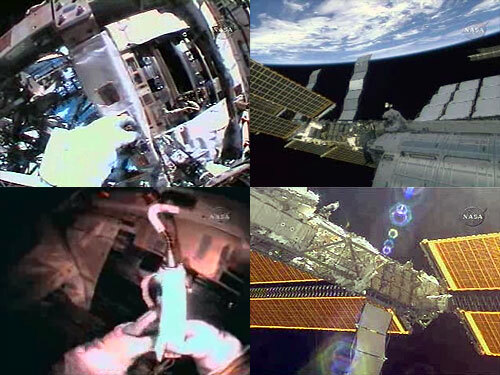 Today's spacewalk was the 115th dedicated to space station assembly and the 87th to originate from the ISS. In total, astronauts and cosmonauts have spent 725 hours and 40 minutes outside the outpost. This was Piper's third spacewalk for a career total of 20 hours, and Bowen's first. 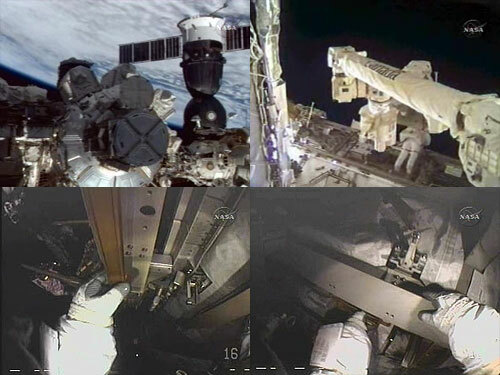 During the spacewalk, the astronauts inside the station continued to move items out of the Leonardo logistics module. 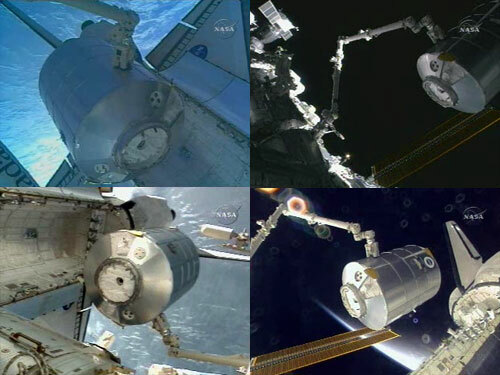 The crew is ahead of its transfer timeline and focused on moving two water recovery system (WRS) racks and one of the new sleep stations into the ISS. The crew is due to go to sleep tonight at 11:55 p.m. CST and will wake up at 7:55 a.m. on Wednesday. Composer Aaron Copland's "Fanfare for the Common Man" served as today's wake-up call for the STS-126 crew, as chosen by pilot Eric Boe's family. The crew's activities today will focus on the work of "common men", moving supplies and equipment between the shuttle and station. The astronauts will install several racks in the Destiny laboratory, as well as two additional crew quarters in the Harmony module, providing the capability to increase the station crew size from three to six by spring 2009. Heide Stefanyshyn-Piper and Shane Kimbrough will also prepare for their work outside the station on Thursday, the 10th anniversary of the International Space Station. As Don Pettit and Mike Fincke continued to install the new water reclamation system inside the Destiny laboratory, Fincke paused to show the ground the back panel to one of the refridgerator-size racks. "We certainly appreciate all the hard work by all the technicians, engineers and the entire team to help us get all these new racks together and I know the team has been working on them for a long time," Fincke told capcom Terry Virts. 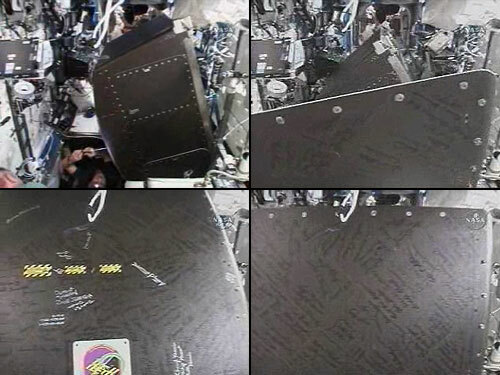 "So, they are proud of their work, we are really proud of them and so we're really glad to take care of their signatures with us up here in space." Home improvements continued aboard the International Space Station with installation of two new bedrooms and preparations to activate a water recycling facility. Station flight engineer Sandy Magnus and her predecessor Greg Chamitoff moved the port and starboard crew quarters to the station and installed them in the Harmony node. They also installed a rack with equipment for return to Earth inside the Leonardo logistics module. Transfer of all of the phone-booth-sized racks planned for this mission has been completed. Transfer work overall is about 25 percent complete. Former Expedition 6 resident Don Pettit and Expedition 18 station commander Mike Fincke spent a bulk of the day configuring hardware on the new water recovery system. The facility will recycle water so that it is clean enough to drink. It will take about two days of initial operations before the first sample of water processed from urine is available for testing. This evening, crew members began preparing for the second of four spacewalks by gathering tools and reviewing procedures. Subsequently, Heide Stefanyshyn-Piper and Shane Kimbrough began the standard pre-EVA campout in the station's Quest airlock. Endeavour's crew is scheduled to go to bed at 11:55 p.m. CST and be awakened at 7:55 a.m. Thursday. The spacewalk is set to start at 12:45 p.m.
STS-126 mission specialist Don Pettit awoke this morning to the sound of his wife's voice, singing "Summertime" with Bandella. "When you're orbiting Earth, someplace is always summertime," replied Pettit. In addition to Michi Pettit, members of the group include astronauts Steve Robinson, Chris Hadfield and Cady Coleman. STS-126 mission specialists Heide Stefanyshyn-Piper and Shane Kimbrough will work outside the station today for the second of the mission's four spacewalks. Their tasks include the relocation of two crew and equipment translation aid carts, the lubrication of the Canadarm2 end effector, and the continuation of cleaning and lubrication of the starboard solar alpha rotary joint. Inside, Pettit and Expedition 18 flight engineer Sandy Magnus will operate the station's robotic arm, and pilot Eric Boe will be the spacewalk coordinator. Piper and Kimbrough are scheduled to leave the Quest airlock at 12:45 p.m. CST, but are running ahead of schedule and may start the spacewalk as much as 40 minutes early. The second of four spacewalks planned for the STS-126 mission began at 11:58 a.m. CST, approximately 50 minutes ahead of schedule, as Heide Stefanyshyn-Piper and Shane Kimbrough took their spacesuits to internal power. Piper's suit is marked with solid red stripes; Kimbrough's suit has broken red and white stripes. One of the first tasks for Piper was to inspect a blemish on the Canadarm2, the station's robotic arm, that appeared between the "a" and "n" and in the "Canada" logo. 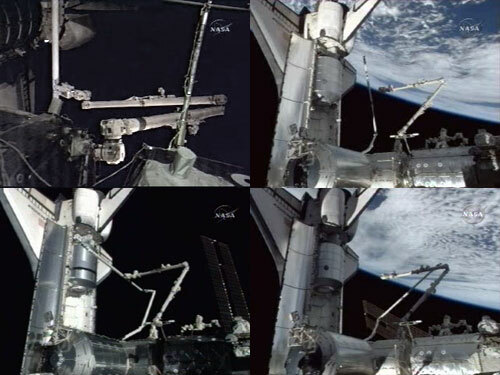 "Looking at the Canadarm, it looks like there is almost like a speck of something hanging off at about that location where that blemish is," described Piper, adding later that she didn't see any exposed wires. 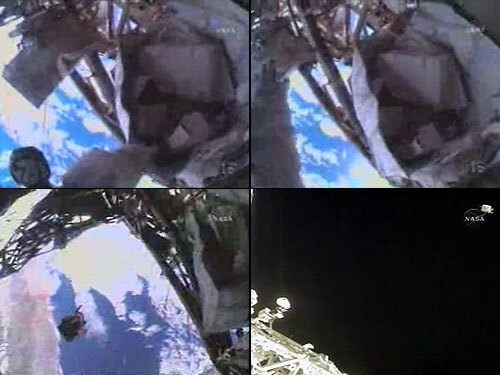 Thursday's spacewalk ended at 6:43 p.m. CST for a total time of six hours and 45 minutes. As the spacewalkers were finishing up their activities, ground controllers noticed that Shane Kimbrough's carbon dioxide levels were increasing, so he made his way back to the Quest airlock a few minutes ahead of Heide-Stefanyshyn Piper. 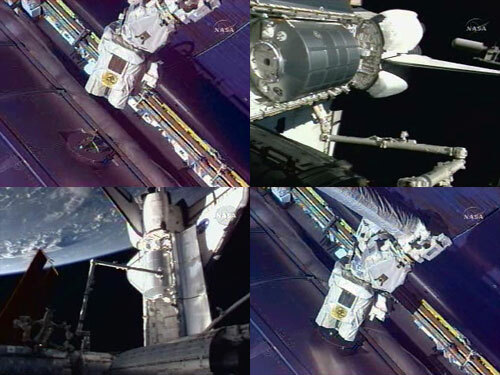 Piper and Kimbrough began the STS-126 mission's second spacewalk by relocating two equipment carts in preparation for February's installation of the final pair of solar arrays. 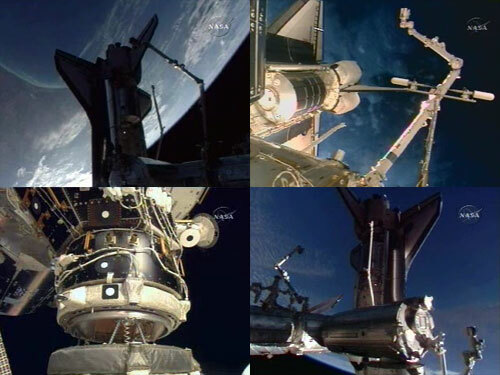 Once that was complete, the two applied lubrication to a balky snare on the end of the station's Canadarm2 robotic arm before concentrating on the repair of the starboard solar alpha rotary joint (SARJ). The balance of the spacewalk was focused on replacing four more of the twelve trundle bearing assemblies. One of them was over-torqued while being installed, so Piper used one of the two back-ups instead. Mission Control will wake both crews up at 7:55 a.m. Friday to begin Flight Day 8. "I would like to thank my family and all of my friends for that lively song to wake us up and get us ready for another fun day in orbit today," radioed STS-126 mission specialist Heide Stenfanyshyn-Piper after the Ukrainian-language song "Unharness Your Horses, Boy" performed by The Ukrainians was played by mission control. The astronauts will spend most of their day continuing the transfer of supplies between the Endeavour and the station. The water recovery system rack they moved and installed earlier in the flight has begun processing urine for a series of tests before it can go into service for the crew. At 11:10 a.m. CST, shuttle commander Chris Ferguson, pilot Eric Boe and mission specialist Steve Bowen will oversee a small reboost of the space station altitude using spare propellant aboard Endeavour. At 2:05 p.m., the ten shuttle and station crew members will participate in a joint news conference before reviewing procedures for their mission's third spacewalk scheduled for Saturday afternoon.